Do you ever have those moments when you think you understand what someone is asking of you; but really you haven't a clue? That is what happened to me earlier this year, when Patchwork Professional, a well respected German quilting magazine, contacted me. Aside from what you might think, there were no language barriers, I just couldn't wrap my head around what they were asking of me. Well, because it turns out they didn't want a quote from me about modern quilting; which is what I had thought. They wanted to do a whole story on me, my work and oh, yeah...include a quilt pattern that I designed for them. It became more surreal when I did a little research and learned that they only publish 4 issues a year, and the issues this year have featured Luke Haynes and Jacquie Gering. Yeah, now do you see why I didn't get it at first. Collaborating with Patchwork Professional was a wonderful experience, and honestly if it wasn't for seeing the screen-capture below, it would be hard to believe that it happened. Yet, right there on the cover is my STAR'D quilt and MY name. Holy Sh*t! 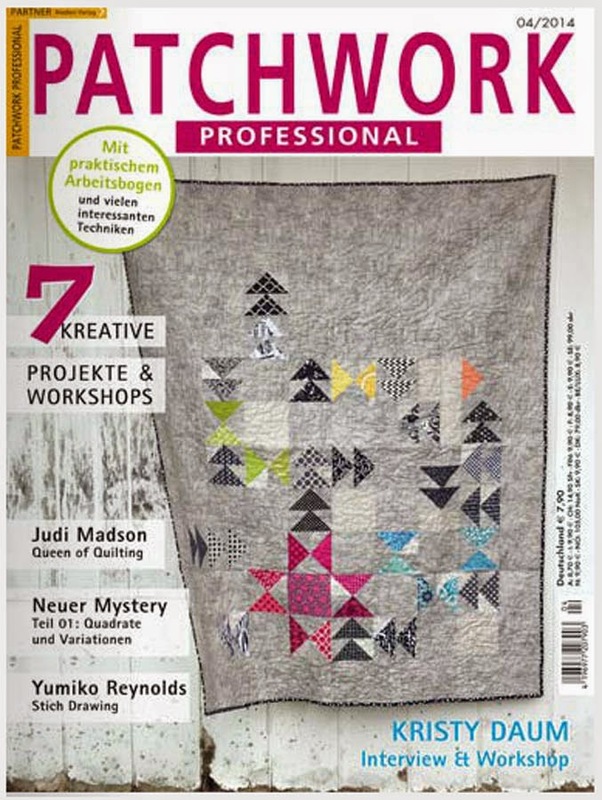 While you likely will never see this magazine in the United States (and of course it is entirely in German), You can get a preview at the Patchwork Professional website here; just be sure that you translate the page first unless you are fluent in Deutsch. I can't wait to get my hands on a copy to see how it turned out, what additional quilts they included, etc. So now you know one of the many quilting secrets I've been keeping this year. It was a Biggie!!! wow! You are becoming quite the rock star! Wow! That is super exciting! Congratulations! Kristy, that is sooo exciting! I'm happy for you! Happy dancing here, too, friend! Congratulations!!!!! Kristy I enjoyed working with you anytime angain. You're so funny. And truly talented. Congrats!! Congrats! I'm wondering whether they use inches or centimetres? The latter are a nightmare to do patchwork with, even though the metric system is what I use normally.